← If Beauty Passed You In A Subway, Would You Notice? As we pulled into the music shop where my daughter was going to have a lesson, a sign got her attention. “Look, Dad. 2 for 1 Donuts. Can we get some?” she asked imploringly. “Humph,” she muttered as she went into her lesson, disappointed but probably not surprised. Forty-five minutes later, I pulled back into the parking lot. I looked over at the sign again. Still 2 for 1 Donuts. Motivated by my clever plan, I went over and bought the donuts from the smiling attendant. Handing him a crumpled dollar, he thanked me as if I had just bought a Mercedes. I knew this was a good idea. And cheap too! 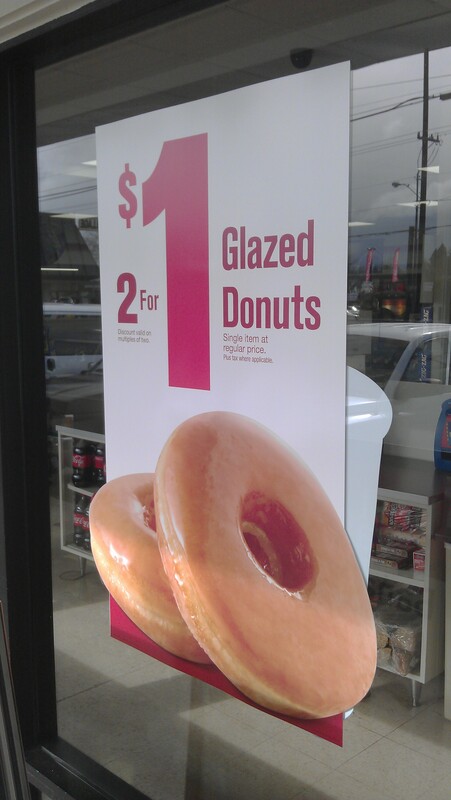 But when I got back in my car, and looked at the glazed donuts, I realized that I wanted something other than a donut. I wanted something cheaper. Something deeper. My daughter came out of the building and got into the car. I handed her the bag of donuts and she gave me a huge smile. When I said that both were hers, she smiled again. That’s all I really wanted. A smile. And for the same dollar, I got two. Bought my daughter two donuts. Bought myself two smiles. This entry was posted in Around the House and tagged donuts, giving, oscar wilde, smiling. Bookmark the permalink.